While hair transplantation may rightly be considered a medical/surgical specialty it is NOT recognized as such by the American Board of Medical Specialties (ABMS). Therefore, there are no official residency programs or board certification exams associated with this discipline. 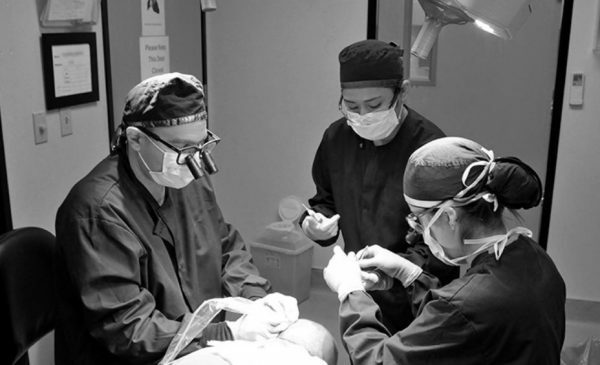 If a physician wishes to learn and practice hair transplantation he/she must either figure it out for themselves or train at the side of another physician who has already learned (and hopefully mastered) the procedures. Yes, you read that right: ALL licensed physicians may perform hair transplant surgery on their patients both legally and competently. You may be surprised to learn that it doesn’t matter if their training was in plastic surgery or psychiatry. To become any kind of physician in the United States one must demonstrate competency in certain basic medical and surgical skills, this includes minor in-office based surgical procedures-which is how hair transplant surgery is currently (and correctly) categorized. When hair transplantation was in it’s “Plug” phase one really didn’t need much training or experience. In fact, one physician could simply tell another physician over the phone what to do. No in-person training was required. But that all changed in the late 1980’s when the hair transplant field experienced a renaissance with the invention of micrografts, minigrafts, and follicular units and became so complex that trying to figure it out for one’s self was not only unwise and impractical -but most likely a legal liability as well. Physician training, even if not recognized as an official medical specialty, was in great demand and many doctors responded to both teach and learn. The International Society of Hair Restoration Surgery (ISHRS) was thus founded in 1991 through which structured and academic approaches to educating and training doctors interested in performing hair transplant surgery were created. Any licensed doctor could join, and about 1,000 have as of 2018 . The Society created its own Journal, held meetings/lectures, and gave live workshops through which doctors shared their techniques and even earned continuing medical education credits (CME). The ISHRS offered great primers for hair transplant basics and even offered fellowships for doctors who weren’t fortunate enough to be able to find an experienced hair transplant doctor from whom to learn from. By and large, however, most new hair transplant doctors learned by working with established hair doctors who then took them into their practices. At least that how it was until about 2009 when many doctors started to claim specialization and expertise in hair transplantation even though they had little to no basic training, practically no experience, and no apprenticeship. Such doctors might attend a meeting or two and then buy a machine that, according to the manufacturer, put them on the “cutting edge” of hair transplantation. These companies offered marketing materials and guidelines and in the process attempted to discredit the very foundations that made the hair transplant the industry what it is today. To make matters worse, many of these doctors unlawfully delegated much or all of their hair transplant surgery to unlicensed staff. To their everlasting credit the ISHRS moved swiftly to block these doctors from membership. So how can you tell the difference between a hair transplant doctor who paid their dues from the ones who think they can cut corners by buying a machine ? Simply visit their website and see if they are FUE-only clinics that claim to use the “most advanced” equipment in the world, or some such sensational language like that. If you see that, be suspicious. Then look at their results. Compare them to the results of HTW doctors in your area who do not use a machine. It should become obvious very quickly who the better and more meticulous surgeons actually are. In the end : where a doctor trained, what specialty they trained in, NOR even how long they report they have been performing hair transplant surgery actually matters. What matters is actual day to day experience and results THAT YOU CAN SEE.